In the DNA Structure unit students are learn to the structure of DNA. The structure of DNA molecule is vital for understanding the replication and functioning of the molecule. ​The unit is planned to take 2 school days. ​The structure of DNA allows efficient storage of genetic information. List types of models used in science. State a common feature of models in science. List ways in which models are different from the structure or process it represents. 2.6.U1 The nucleic acids DNA and RNA are polymers of nucleotides. (Oxford Biology Course Companion page 106). State the two types of nucleic acid. Outline the parts of a nucleotide. Identify and label carbons by number (for example, C1, C2, C3) on a nucleotide drawing. Explain how nucleotides can connect to form a nucleic acid polymer. State the names of the nitrogenous bases found in DNA and RNA. Identify nitrogenous bases as either a pyrimidine or purine. State the complementary base pairing rules. 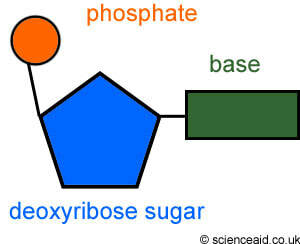 The base and phosphate are both linked together by covalent bonds to the pentose sugar. 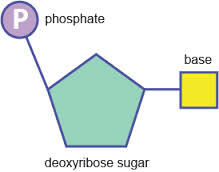 The four different nucleotides can be linked together in any sequence because the phosphate and sugar used to link them are the same in every nucleotide. Any base sequence is possinle along a DNA or RNA molecule. Define antiparallel in relation to DNA structure. Outline the formation of a DNA double helix by hydrogen bonding between nitrogenous bases. Identify the four bases of DNA based on the numbers of rings (purines or pyrimidines) and the number of hydrogen bonds it can form. State the number of nitrogenous bases per complete turn of the DNA double helix. Outline the role of Chargaff, Watson, Crick, Franklin and Wilkins in the discovery of DNA structure. Explain how Watson and Crick used model building to determine the structure of DNA. Draw the basic structure of a single nucleotide (using circle, pentagon and rectangle). Draw a simple diagram of the structure of RNA. Draw a simple diagram of the structure of DNA. ​​​​Correct use of terminology is a key skill in Biology. It is essential to use key terms correctly when communicating your understanding, particularly in assessments. Use the quizlet flashcards or other tools such as learn, scatter, space race, speller and test to help you master the vocabulary. A decent tour of the basics, from Learn.Genetics. The story of the elucidation of the structure of DNA illustrates that cooperation and collaboration among scientists exists alongside competition between research groups. To what extent is research in secret ‘anti-scientific’? What is the relationship between shared and personal knowledge in the natural sciences? ​An exploration of the structure of deoxyribonucleic acid, or DNA. Hank introduces us to that wondrous molecule deoxyribonucleic acid - also known as DNA - and explains how it replicates itself in our cells.